I read my first Betty Rowlands last week and now I am hooked! it is a rather addictive type of cozy and I will be sad when I cant get any more! A local couple are vociferous when they find out that the old, broken down freezer that they put out for Council pick up has been nicked. Why they should be so angry only they will understand. They are even more angry when they discover that the murdered body of a girl is found in the dilapidated freezer. Slowly unraveling the mystery is Melissa Craig our own mystery murder writer and always looking for new copy to the annoyance of her boyfriend Ken former Police. The setting is idyllic. 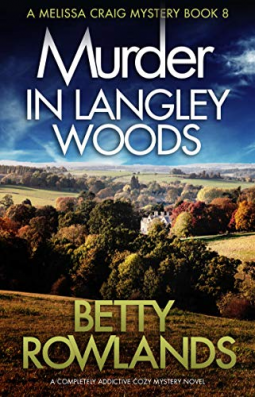 We have a Cotswold village, all the usual characters and ongoing with the murder and solving the crime is Melissa's own personal life and how it is going to turn out. Her friend who owns the adjoining cottage has decided to move to Provence and get married and wants to know within a week what Melissa's idea is about buying her out and then we have her partner Ken also pressurizing her to decide on how they could make their partnership more permanent. Hannah Rose our victim is from a colony of travelling gypsies. They are furious with the man who took her away and who is hence responsible for her death and they want to mete out their own form of justice to him. Hannah also took a ride to Hungary with a truck driver in the area and all signs point out to Rocky as the most likely suspect responsible for Hannah's death. Like all village murder settings, the suspect and the actual murderer are two completely opposite characters. You'll be kept guessing till the end. Sent to me by Netgalley for an unbiased review, courtesy of Bookouture. I can tell you enjoyed this one. I think my mom would like it too. I haven't read anything by this author, this sounds good! I've been eyeing this one on NetGalley. It looks wonderful. I'm glad you enjoyed it. I've enjoyed a couple in this series, but I can't say I'm addicted yet. From your description, I think this must take place soon after the one i just read.